Brentford have completed the signing of Reading striker Nicholas Bignall on a loan deal until 1 May. 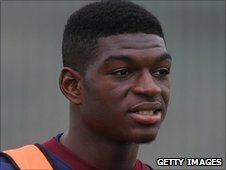 The 20-year-old has spent time on loan at Southampton, Bournemouth, Stockport and Cheltenham in recent years. "This will give us good options both down the left hand side and also in attack," Bees boss Andy Scott told the official club website. "Nicholas is a player who has been on our radar for a while. He knows this level well."